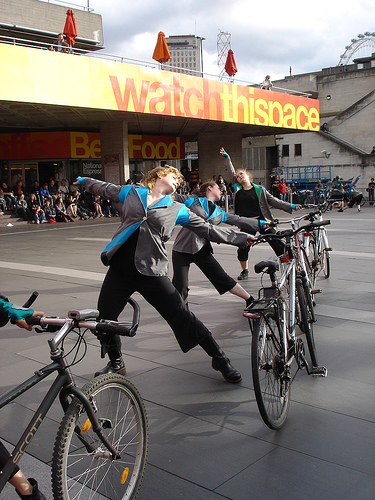 30 minute show created for Watch This Space with dancers from Laban, the original Brighton Chorus and London cyclists. ‘A thrilling and quirky combination of cycling and choeography that was more exciting than the Tour de France,’ Angus MacKechnie, Producer, Watch This Space. Performers: Sarah Alexander, Emma Capon, Sally Cranfield, Niamh Dilworth, Cat Dinopoulou, Kate Evans, Virginia Farman, Max Glaskin, Simon Khamara, Angus MacKechnie, Nora Mackey, Ruth Morris, Nick Papavassiliou, Helen Prosse, Ulrike Schilling, Aedin Walsh, Melita Welstead.